Hardy Zones 6-9 Full to Part Sun Deer Resistant Mature Height: 25' Immediate shipping in 4" pot. Dormant shipping in winter. 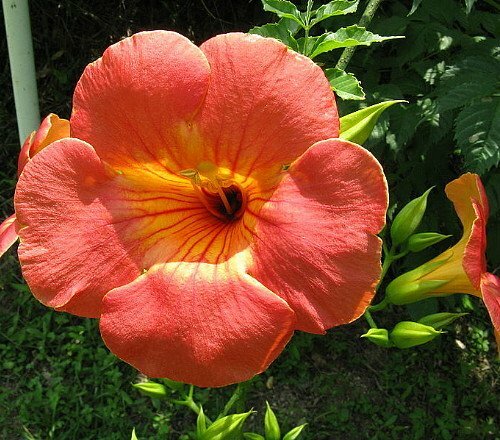 Campsis grandiflora, commonly known as the Chinese Trumpet Vine, is a fast growing, deciduous creeper with large, orange, trumpet-shaped flowers in summer. It can grow to a height of 25 feet. A native of East Asia, China and Japan. Clematis - easy-to-grow, long-lived, climbing vines - are a favorite of both seasoned and beginner gardeners, due to their versatile beauty. Cascading colorful blooms over walls and fences or winding their way up trellises, pillars, mailboxes, lampposts, or even through rose bushes, long-blooming Clematis dazzle year after year, providing a wealth of brilliant colors and attractive features in the form of flowers, foliage, and decorative seedheads.